Long Beach Lodge Resort in Tofino, Canada. Ranked #60 in our countdown of the 100 Best Hotels and Resorts in the World. 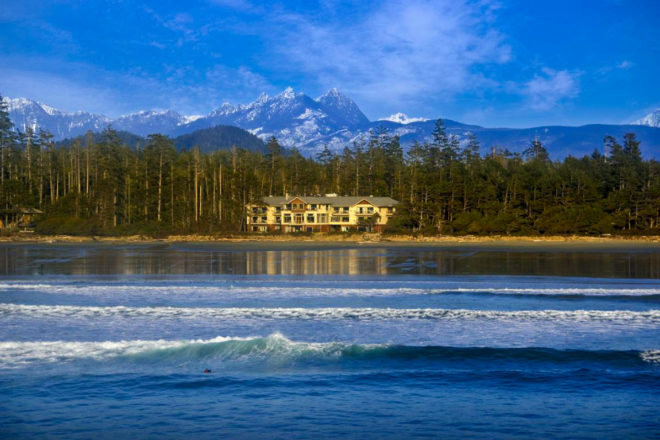 This remote lodge sits on Vancouver Island’s rugged west coast. Surf (and surfers) tumble in all day – it’s mesmerising. You can hike, kayak or zipline through the Kennedy River Canyon. Wildlife watching is incredible (there are bears!). Inside is cosy with a huge stone fireplace and floor-to-ceiling ocean views. The cuisine suits the surroundings: fresh seafood and foraged produce. Did you know From June to November, orcas, humpbacks, porpoises, sea lions, harbour seals and resident grey whales pass through these waters.